I’ve never been the most intense athlete, but I work out regularly. When a friend at the gym told me about how much compression socks had helped him with his workouts and recoveries, I knew I had to give them a try. Anyway, I got my hands on some Nike running socks. 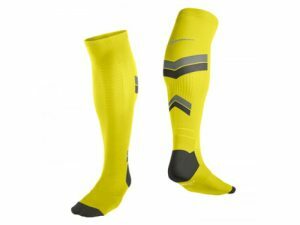 Afterwards, decided to write this Nike compression socks review so I could share the experience with you. You’d be hard-pressed to find someone unfamiliar with Nike. Its brand is ubiquitous and considered worldwide to be the favorite of champions. You can count on Nike to feature heavily at all types of professional sporting events, from the Olympics to Major League Baseball and even professional rowing. Nike compression socks have a couple of key uses. First, they provide additional support to muscles and ligaments in the ankles and lower legs during physical activity. Second, they gradually compress the leg muscles–starting with stronger compression in the ankles and easing off higher up the calf–which improves blood flow to the affected area. This helps with recovery and reduces muscles soreness the day after a big workout. These socks are designed to contour to your feet anatomically, meaning that there are designated left and right socks. Their compression strength goes from 17-21 mmHg in the ankles to around 14-17 mmHg towards the upper calves. Lastly, Nike’s patented Dri-Fit fabric pulls moisture away from the body and toward the exterior of the fabric. While compression socks can really benefit almost anyone (travelers, nurses, people who work on their feet for long periods, etc. ), these particular socks are marketed to athletes who use them to increase performance and promote recovery after strenuous workouts. The really great thing about these socks is how much of a difference they make in the pain during and after a workout. 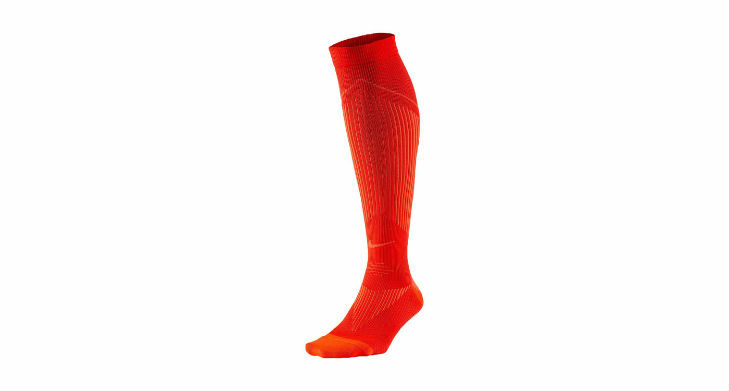 It’s sort of weird to think that something as simple as wearing a special kind of sock can have such a great impact on you, but it makes sense if you think about it: remember R.I.C.E.–your coach’s generic prescription for treating an injury? Rest, ice, compression, and elevation. If there were a job description for compression socks, durability would surely be on the list of desired attributes. Unfortunately, these socks don’t quite measure up in that department. They can sometimes tear relatively easily, and considering how much they can cost, that can be a pretty big bummer. Another problem is that they aren’t really that stretchy. Don’t get me wrong: they aren’t baggy if you order the right size. They’re just pretty unforgiving when it comes to getting them on your feet. You might have to use some kind of powder to help get your feet in them. There are quite a few alternatives out there for anyone looking to move beyond Nike. CompressionZ, 2XU, and Under Armour are some of the popular competitors of Nike in the compression gear market. 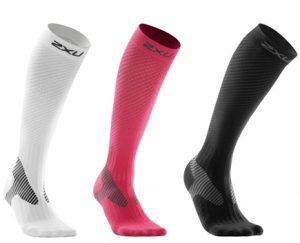 2XU vs Nike: If durability is important to you, I’d suggest going with a compression sock made by 2XU. You can check them out on Amazon.com here. They are made with high filament yarns. Personally, I don’t think these socks are worth the money they cost. There are plenty of alternatives, both from rival companies and lesser-known competitors, that can provide the same function for less money.